Welcome to Winchester's multi-award winning dog daycare centre! Situated in the rural countryside of Otterbourne between Southampton and Winchester, ScenterBarks dog daycare centre is designed to provide a large and safe play area for dogs of all ages and sizes to provide company, entertainment and socialisation while you are at work or away. There is also a pick up and drop off service provided. ScenterBarks also offer dog walking in Winchester and surrounding areas including Eastleigh, Chandlers Ford, Romsey and Southampton with a team of experienced dog walkers. They are fully insured, licensed by Winchester City Council (License no' 17/03563) and pet first aid certified and have staff who are studying with, or are members of the Institute of Modern Dog Trainers. Register now and get in touch to book your visit and we can show you our facilities. ScenterBarks is a 4,500 sq ft multi-award winning dog daycare centre in Otterbourne, Winchester has been specifically designed to ensure maximum fun and safety for your dogs while you are at work or busy. Your dog will have the opportunity to play with new friends in the large play area or garden, play ball or sniff for treats and learn new social skills. After all that they have a nap in the chill out room or on our many sofas and have a cuddle with the staff before getting back up to start again before home time! Winning a business of distinction award for our dog daycare, your dog could not be in better hands! 5 Star! Best doggy daycare ever!! Wow, amazing place, just about sums it up!! Fudge's second family, & I would highly recommend them to anyone looking for daycare for their fur babies. All the staff are super friendly & love & care for Fudge as if she were their own. They've helped Fudge overcome her nerves around people, spending time to bond with her, & put her trust in them, and it's a real social hub for the doggies too. Fudge has an absolute blast when she's there, and we'd be lost without their amazing service. Fudge is always happy to go to daycare, giving kisses & cuddles to everyone as soon as she walks through the door. Scenter Barks has been an absolute gem of a find for us, and all the staff are absolute troopers, and happy to accommodate Fudge's needs & I can't thank them all enough. Scenter Barks are one big happy doggy family!! 5 star! I'd be lost without them. Scenterbarks has been a lifesaver for me having a dog with separation anxiety. I drop my dog off in the morning knowing he is in the best hands and being extremely well looked after. They all treat the dogs like their own. My dog gets so excited in the car on route when he realises where he's going and it's great to see him so happy. Scenterbarks goes above and beyond in their care and we think they are amazing. Would definitely give more than 5 stars if I could. 5 star! Fabulous place. Sydney loves going to doggy day care. It's his home away from home. When he's not at doggy day care he is having a lunch time walk he's always left absolutely shattered. He always looks forward to either option when Scenterbarks is involved... he's one happy pooch. 5 star. Barney' second home. Our cockerpoo Barney has been coming to Scenterbarks since he was a puppy and absolutely loves his time with the team. My husband and I are both full time professionals, getting a puppy was something we had planned and thought about for a long time. We didn't want our dog to be on his own for long periods of time during the day so did lots of research before getting him and when we discovered Scenterbarks, we were so pleased with the range of care they could offer us and felt we could therefore have a dog! We have used Scenterbarks for dog walking and day care. They are incredibly reliable and very flexible. Barney is always very excited to see one of the team for walks and is always happy to be dropped off at daycare. The booking system is vey easy to use and our 'ad hoc' need is always catered for. Wouldn't use anyone else for our day care needs and I would definitely recommend them! 5 star. Scenterbarks is a brilliant place for day care and dog walks, I use both. My dogs love the centre and love their dog walks. All the staff are brilliant and Nikki and Lucy are always so helpful and will accommodate anything I ask. Don't know what I'd do without them! 5 star. Cedric's favourite place. I couldn't rate the team at Scenterbarks highly enough! My dog is always so excited to go and you can clearly see how much he loves each and every one of the team when he sees them. I have no concerns about leaving him in their capable hands. The daily photos and updates are great too! Would definitely recommend to anyone who is looking for daycare or dog walkers! 5 star. Fantastic, knowledgable, doggy daycare centre. Twix has a great time at Scenter Barks and we know she is well cared for there. 5 star. My springer Harvey has been going to Scenterbarks since it opened. There are only good things that I can say about it. I don't worry about Harvey during the day as I know that is well looked after and exercised through the day. And he gets cuddles when I'm not there, he's so excited when he knows he's going. Then when I pick him up 5 minutes later he is asleep and that's it for the rest of the evening. I trust Nikki and Lucy implicitly with Harvey and they have a great team of people that help to love and care for Harvey too. 5 star. Best place EVER - Jupiter loves it when he gets to spend a day here - Nikki is always so welcoming and accommodating with that last minute phone call when work calls!! 5 star. Our little Poppet loves it here! She always comes home happy and nice and worn out!! She's a rescue who had been through quite an ordeal before we adopted her, normally she suffers with separation anxiety when I'm not around but she doesn't even give me a second glance when she gets to Scenterbarks! She gets so excited and just bounds in! I completely trust that she's getting all the love, attention and playtime she needs while she's there. 5 star. Highly recommend Scenterbarks. We use them for daily walks, the pick up and drop off service and value for money is excellent. Their over night boarding is exceptional, our dogs have a home from home and they certainly do make 'going on holiday so much easier'. We really can't thank them enough. 5 star. Roscoe has the BEST time at daycare! The team are so great with him as well - ensuring any of my initial concerns were met. On his first day there, they even provided with a mid-day check-in to make sure I knew he had settled in well. He greets the pick up service with such enthusiasm, and can't wait for his days there. 5 star. My dog Maisie has been going for walks, day care and overnights with Nikki for over 5 years and just loves it. I've always felt safe and relaxed about leaving her and wouldn't want to use anyone else. 5 star. Nikki you are great. Just want to say a massive thank you for looking after our Hachi. We feel so much better knowing you are there to care for him. So thank you for all the advice and help, we have only just started at scenterBarks and we love it already! Many thanks Hachi Emma and Kirsty:). 5 star. I highly recommend ScenterBarks. Our crazy choc lab, Rufus absolutely loves going to daycare. He's very well looked after and comes home a tired and happy boy. ScenterBarks treat Rufus like their own and are brilliant with him, even accommodating my sometimes short notice requests to keep our nutty boy happy! I also love the photos ScenterBarks put on Facebook of the dogs - you can see how much fun all the dogs have! 5 star. My puppy Brandy has been going to Scenterbarks for a month now and she absolutely loves it! She gets so excited when we arrive and she loves the attention from all of the staff. I can't recommend them enough...they do a fantastic job of looking after Brandy and it's so nice to know that she's with someone I can trust to look after her...the fact she comes home so sleepy is an added bonus! 5 star. Superb walking service . Bailey genuinely loves his walker Catrin! , and looks forward to her visits. I completely trust my precious pooch in her care and would definitely recommend ScenterBarks. 5 Star. Hera has been coming here since she was a puppy. It’s been a godsend having somewhere I can take her whilst working and knowing she will be having a blast. I love being able to see all the pictures of her having fun with her doggy friends. She loves all the lovely ladies that look after her and always comes home really tired and happy. Thank you to everyone at ScenterBarks! Leaving your dog home alone when you go off to work or for a day out is an awful feeling, as dog lovers we understand. Picture your pooch running through the Hampshire countryside having the time of its life with other dogs, supervised by highly experienced dog walkers or even better coming home from a long day at work to a happy, content, tired best friend. Scenterbarks cover areas including Winchester, Chandlers Ford, Eastleigh, Southampton and Romsey. that will make them really happy? Categorisation, so you know which walks include rivers, parks, woodland, wildlife and more. These are our favourites, and we'd love to hear about your favourites too on our Facebook page! 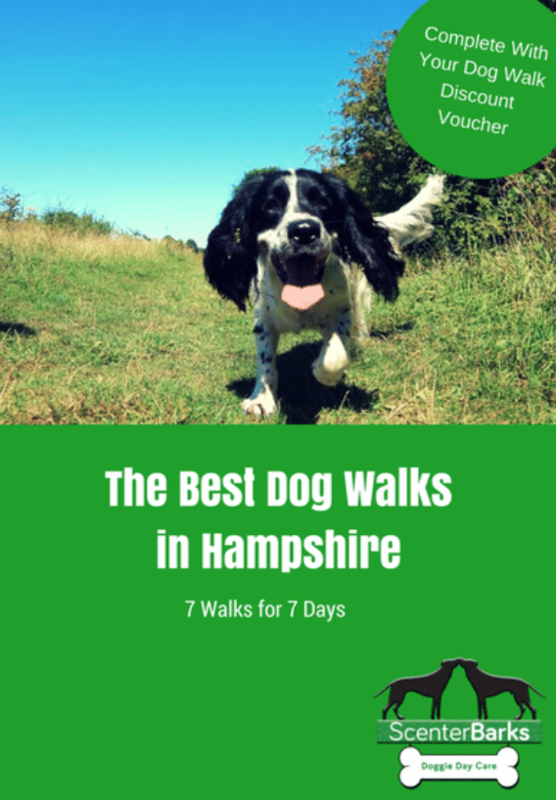 Click Here to get our great little guide of Hampshire Dog Walks - with 7 walks for 7 days!